Artist and activist Keith Haring (1958–1990) first gained public attention during the early 1980s with anonymous graffiti drawings in the New York subway system. After a few high-profile commissions, his iconic imagery was appearing on everything from posters and T-shirts to coffee mugs and wine labels. His stated ambition was to break down the barriers between high and low art, much as his friend Andy Warhol had done. 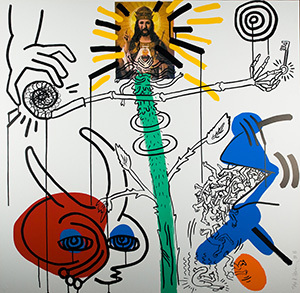 Always politically conscious, Haring used his fame and talent to heighten awareness of AIDS, apartheid and the crack cocaine epidemic, and became involved with several children’s charities. In 1988, shortly after he was diagnosed with AIDS, he collaborated with the Beat writer William Burroughs to create the Apocalypse portfolio. Haring’s provocative imagery and Burroughs’s stream-of-consciousness poetry create a vision of the HIV virus as a harbinger of the end of the world. The artist died two years later, at the age of 31. Pictured: Apocalypse (1988). Serigraph. Gift of Sharon and Neil Norry, and Lewis Norry and Jill Katz Norry.